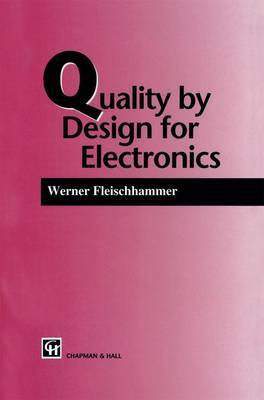 This book concentrates on the quality of electronic products. Electronics in general, including semiconductor technology and software, has become the key technology for wide areas of industrial production. In nearly all expanding branches of industry electronics, especially digital electronics, is involved. And the spread of electronic technology has not yet come to an end. This rapid development, coupled with growing competition and the shorter innovation cycle, have caused economic problems which tend to have adverse effects on quality. Therefore, good quality at low cost is a very attractive goal in industry today. The demand for better quality continues along with a demand for more studies in quality assurance. At the same time, many companies are experiencing a drop in profits just when better quality of their products is essential in order to survive against the competition. There have been many proposals in the past to improve quality without increase in cost, or to reduce cost for quality assurance without loss of quality. This book tries to summarize the practical content of many of these proposals and to give some advice, above all to the designer and manufacturer of electronic devices. It mainly addresses practically minded engineers and managers. It is probably of less interest to pure scientists. The book covers all aspects of quality assurance of components used in electronic devices. Integrated circuits (lCs) are considered to be the most important components because the degree of integration is still rising.